Blockchain service that allows you to obtain the service you need in the right place at fair price and at convenient time with a single click. Services market – massage, haircuts, manicure, food delivery, repair and construction services, plumbing and any other service that you might need. - The company profit will be distributed among token holders once a quarter. - Token holders providing services in the Noxbox application will receive an additional bonus for the service provided. 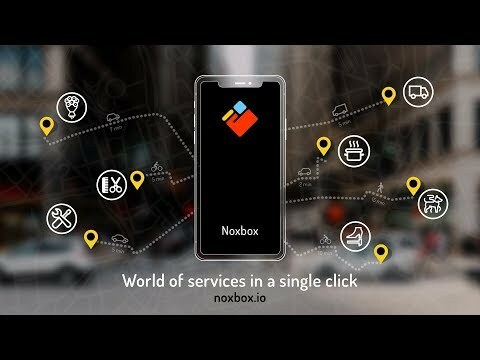 - Token holders receiving services in the Noxbox application will receive a discount on the received service. - Rating is saved in the blockchain. For example, Consumer requested a service (let's say a haircut) and was dissatisfied, he post a low mark on the Performer, the data is saved in the blockchain. As a result ratings can not be hidden, changed or deleted. The Noxbox platform will be available only to performers and users with higher rating, that will ensure the highest quality of services. - Biometric identification of the performers according to the geometry of the face and iris of two eyes. It will be impossible to register user twice and hide quality rating for provided services. - Services on demand. The application shows Performers who are available right now, ready to arrive to you within 5-15 minutes. No need to wait for the processing of your request or call from the operator. You get the service instantly. - Guaranteed payment. Smart contracts will guarantee the payment for Performer for provided high quality services. - Fair price. In the modern world, many services have unfair prices, so you may pay a service price 2-3 times higher than its market value. The Noxbox platform will automatically calculate the price depend on demand and supply. You will always receive the service only at an honest and fair price. - World without borders. Users can always continue to receive services while traveling in other countries. - Quality assurance. Users of the Noxbox application can be sure that the quality of provided services is always high. Get your bonus for investing: +10% Noxbox for more than 500 USD +20% Noxbox for more than 1500 USD +30% Noxbox for more than 5000 USD Reward for each referral - 10% of referral payment.